Have you seen the news that consuming brown rice is associated with a lower risk of type 2 diabetes? The June 14, 2010 issue of the Archives of Internal Medicine contains the results of a Harvard study which shows that five or more servings of white rice per week increases your risk of developing type 2 diabetes, but two servings of brown rice per week decreases your risk. If you already have diabetes or prediabetes, eating brown rice will prevent the blood glucose spikes associated with eating easy-to-digest white rice. Brown rice contains nutrients and fiber that are stripped away during the processing of white rice. More than 70 percent of the rice consumed in the U.S. is white. If you find brown rice to be too “earthy” for your tastes, try replacing just a portion of your white rice with brown. The Harvard study showed that substituting just one-third of a serving of white rice with brown rice could reduce a person’s risk of developing type 2 diabetes by 16 percent. Once you get used to the ratio of 1 part brown rice to 2 parts white rice, try making it half brown and half white. Once you get used to that, try 2 parts brown to 1 part white. Eventually, you’ll be eating 100 percent brown rice. Another technique to help you make the shift from white to brown is to add flavor and texture rather than eating plain rice. This brown rice pilaf with cherries and almonds has a sweetness and crunch that would please even the staunchest white rice aficionado. Serve it with Panko Hazelnut Crusted Turkey Tenderloin and some steamed broccoli. I’ve also been known to heat up leftovers, add some almond milk and call it breakfast! 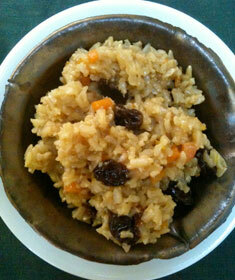 I adapted this rice pilaf from a recipe that appeared in Diabetes Forecast (January 2010). It is low in Saturated Fat, Sodium and Cholesterol and is a good source of Vitamin A, Vitamin K and Manganese. If you’re currently eating 100 percent white rice, are you willing to make the switch to brown to improve your health? Heat olive oil in large pan over medium heat. Add onion and carrot and sauté for about 5 minutes. Add garlic and sauté for about 2 minutes. Add brown rice and sauté for about 5 minutes. Slowly add chicken broth to the pan, stirring, until all broth is added. Increase heat to high and bring to a boil. Reduce heat, cover, and simmer for 45-50 minutes until the rice is done. Turn off heat. Add cherries and almonds to the pot, stir and cover to allow cherries to soften for a few minutes. Season with salt & pepper and garnish with parsley.